Alejandro González Iñárritu deftly uses the language of film to distort reality. Take the single continuous take of Birdman for instance, a technique that induces its audience into a hypnotic state and reconfigures its perception of time. Or the liberated tracking shots of The Revenant that thrust viewers straight onto the backs of horses. Then there’s the handheld cinéma-vérité camera work on Biutiful, which submerges the supernatural in a world that you might mistake for your own. 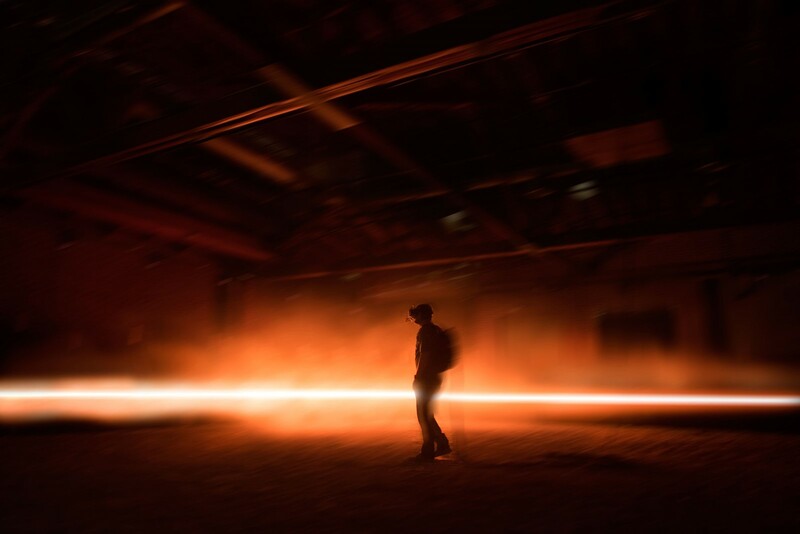 It was only a matter of time until virtual reality, a liminal realm between reality and fiction, would tempt the Academy Award-winning director. 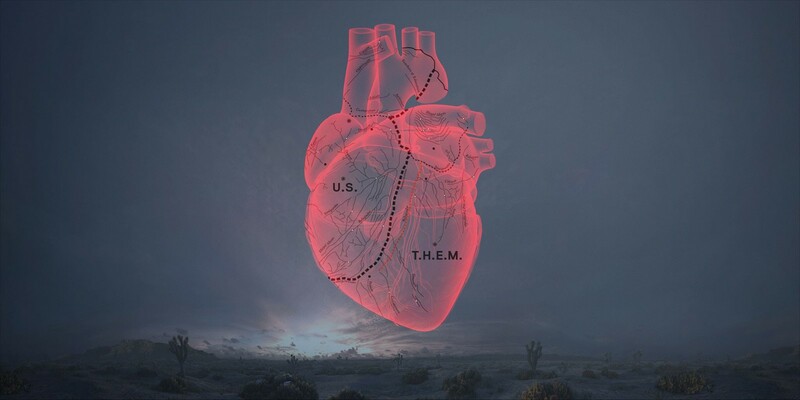 His new project CARNE y ARENA (Virtually present, Physically Invisible), which translates as ‘flesh and sand’, is a six and half minute virtual reality installation that replicates the refugee and immigrant experience. Embedding the audience in a journey through Central America and Mexico in a bid to enter the United States, CARNE y ARENA expands film’s usual limitations, allowing viewers to roam within and explore different parts of each scene, even interacting with its characters. Here, Hans Ulrich Obrist joins Iñárritu to discuss the filmmaker’s disintegration of the fourth wall. Hans Ulrich Obrist: Five years ago you had this epiphany to work with virtual reality, but you said the technology wasn’t ready. What prompted you to work in virtual reality now? Do you remember what the trigger was? Alejandro González Iñárritu: Before Birdman, 17 years ago I started doing exercises on how to submerge the audience much more into the experience with a Café Tacuba music video I did for my first film Amores Perros, a short film called Anna, and an experimental video called Naran Ja, all done in one single long shot with different techniques. But it was after The Revenant when I felt I had learned and practiced enough to revisit the original idea I had for VR some years before and apply what I have learned. It was triggered by an idea and strong images that came after it. My motivation was to use the latest technology to explore the ancient theme of migration and subordinate it to serve and connect to the human emotion. Not just as an observer in a passive way or as a new way of escapism, but actually to blend an abstract narrative space with a physical and sensorial experience in an active way. During the writing and research period of my film Babel, I became very close to the Mexican/American border subject, and I was very moved by the stories I heard from my fellow Mexicans. In Biutiful I explored the African and Chinese immigration problem in Europe. And in Los Angeles, it is inevitable to escape from the reality of millions of Mexican and Central American refugees who feel like orphans of both countries. I invited ILM and Chivo to join and actually, before we started, we did not know if the technology was ready yet, but the only way to figure it out was by doing it. HUO: I very much felt that this project was about the human experience, and very grounded in a way that virtual reality experiences normally aren’t. So I was wondering: how do you subordinate the technology to explore the human condition? AGI: Well, I think what you’re saying is very interesting because that was basically my aim. If the humanity was eclipsed by the technology, we would have failed. For me, technology is just a tool to serve us; if people are aware of the technology as they experience it, I have failed too. When you experience CARNE y ARENA for the first time, there is a lot to take in technologically, physically and emotionally. It’s the kind of experience where the brain wires are suddenly shifted and rewired and misled in a way. So there is a wow factor which your brain can resist and/or intellectualise at the beginning, but then, it succumbs and stops resisting. Your identity shifts as the piece walks and moves into your mind and the sensations and the experience of being in that space, the “narrative space” as I call it, is unlike anything. Very similar to a lucid dream. HUO: I’ve seen it twice now. The first time I was very shy, but the second time, I explored more and then discovered something new. I feel like it’s a painting that you can look at again and again and you’ll always see something else. Was that something you intended? AGI: It has many secrets that will be discovered little by little. And if the viewer stays in the museum for months they’ll find a book and many other secrets. The fascinating thing is that it’s a piece you can experience over and over again, and you will never do it the same way twice and you’ll feel different each time. It is a personal communication between myself, and the visitor. I give you the freedom to go where you want but wherever you go, I’ll know. It is a fascinating new relationship between artist and visitor. It’s very intimate and free at the same time. HUO: I remember the first time I had a VR experience was with William Gibson and Douglas Coupland. We tested it and it was silly, it was just a boat in a lake and occasionally you bumped into a tree. But here, there are collisions and you actually go inside the bodies of the people. AGI: I am glad you went into the bodies. It’s an idea I thought would be interesting to explore. And most people during CARNE y ARENA, because they do not know, don’t do it. I want it to be discovered just by the curious, or if by accident some character crosses a visitor. We are all made of carbon, heat, water and oxygen; we’re all pieces of the same universe. But we put ourselves in uniforms: policeman, American, Mexican… But inside we are all made of the same flesh, bones, livers. Only on the outside are we the policeman, the Mexican or the American. But I wanted everyone to actually see that we are made of the same things and we’re divided by this stupidity of playing roles. I wanted them [the audience] to go literally, into the heart of these people. HUO: Are you interested in mixing VR with reality? AGI: I have to say that in the middle of this project, I was getting into a crisis philosophically where I realised the sad contradiction that I had to go into virtual reality to talk about reality. It’s a paradox. A trap. 15 years ago the Internet was an escape from reality. Now reality is an escape for the Internet. We have lost the ability to be in awe of the complexity and power of real reality. How desensitised are we, that we need to create a virtual reality to make relevant or to feel or react to reality again? Augmented reality can be an impressive technology and unfortunately will be inevitable but as AI, it’s against most of my beliefs, convictions and practices. All I am interested in now is to learn and practice how to be more aware and present in real reality. A capacity that we have all been losing while wasting most of our life in internet reality. HUO: The piece is built from a lot of research. At the end, in the last room, there are portraits with fragments from interviews. Could you tell me a little about the oral history part of this project? AGI: I basically got to know a lot of people through a place in LA called Casa Libre that helps these young immigrants. I interviewed 80 to 90 people, for an hour each. Once I had 14 that I found very interesting, I started working with them and doing theatre workshops in a warehouse. It was kind of like the process of therapy because they didn’t want to go there, they didn’t want to remember. But little by little I got to know them and gained their trust, which meant a lot to me. I put a lot of attention into the small details they told me and, as they re-enacted their journeys, I wrote the script trying to blend their stories as if they had travelled together, as I also attempted to express myself in a subconscious sequence where I interpreted their thoughts and fears. But it was not a normal script at all, it was a multi-layered script with multiple narratives playing simultaneously, and all had to be like clockwork, and it can make you crazy. We also shot film in the desert with them to block the scene and to learn from the behaviour of light, the shadows, clothes movement and textures and every single particle of dust against the dusky sky. HGO: You’ve mentioned that Birdman was incredibly rehearsed and that that was extremely helpful. Was there a difference working with virtual reality? AGI: The main difference is that, even when in Birdman the camera moves constantly in every direction from the point of view of the character, and the rehearsing was extremely rigorous, it’s still cinema. And the rule in cinema is: you will see just what I want and I’ll show you just 20 per cent of the universe. The rest, what you do not see, you fill it up in your mind. And you will be passive and consume. And it’s an art form that has lived beautifully for 150 years. In this VR installation, I needed to create 100 per cent of the universe. Every light and particle of it was created in 360 degrees. And you are active and your experience will depend on you too; and you can go wherever you want, when you want, and without me involved or controlling it. I controlled all without control. I mean, I built the car, but you drive. And losing control can be extremely scary and frustrating as a director or artist. And because the computers and the number of geeks involved, it’s very challenging. They are great but sometimes you face great geeks and can be amazing technicians but not poets necessarily. So to learn the language and understand the limits and tricks of the systems and how it translate to the headsets and the audio can take a lot. HGO: Who are the artists and filmmakers who inspire you most? AGI: One of my favourite directors is [Andrei] Tarkovsky. Every time I see Stalker, besides being embarrassed as a director (laughs), I always feel that I’m seeing a painter, a poet, or a musician at work. He took cinema to its mayor expression. He went far from classical narrative and understood that the language of cinema can be a blend of many other arts to make its own language. [Alexander] Sokaruv has inherited that. He has made some documentaries, visual essays, that are extremely poetic. But in the traditional vein, [Ingmar] Bergman and [Carl Theodor] Dreyer made very deep psychological and poetic films. There are so many that I could go on forever. HUO: Do you want to do more with virtual reality? AGI: Well, I will do a film next, but I already have two more ideas. There is much more to learn and discover. It’s a new tool and possibility, and it can be invigorating for any artist. But as every medium or technology, it can be used miserably too. I was talking with my wife about something that has been bothering me. I find it more and more challenging to be moved or provoked in a museum. You know, to find something that really shakes me. Obviously there are amazing artists and some exhibitions are brave and powerful, but most of the experiences are within a frame of the expected. The thing is, art has become such a commodity and the prices have become crazy and inaccessible for people; like real estate. An object. What I found interesting about this is that, first of all, it’s not a communal experience. It’s you and yourself and nobody else. You can’t have it on your phone or TV, or have a picture and share it on social media. This is not a physical thing. You can’t buy it, or own it, or sell it. You can’t possess it; just live it. As walk in the forest or a swim in the ocean, this is an experience. A singular one. And nobody would have seen, done or felt what you saw, did or felt. And when you try to describe it, very much as a dream, it’s hard to articulate it. An experience. And at this stage of my life, that’s the only thing I am interested in. CARNE y ARENA is showing at Los Angeles County Museum of Art and Fondazione Prada, Milan until January 15, 2018.